novaPDF is a PDF converter that allows creating PDF files from any Windows application that supports printing. If you don't have novaPDF installed, use the Download page to download and install it. Microsoft Office Access is a database management application, part of the Microsoft Office suite. Converting your Access database report (or specific tables, forms and queries from the database) to PDF is an advantage if you want to share the documents with other users (in this case the user does not need Microsoft Access installed to view them). By installing novaPDF you can convert Access reports, tables, forms and queries to PDF easier than ever. Simply choose novaPDF as a printer and once you press the Print button your database reports/objects will be converted to PDFs. Once the database is opened go to the Create tab, click Reports->Report (or use the Report wizard) and a new tab with the report data will be created. 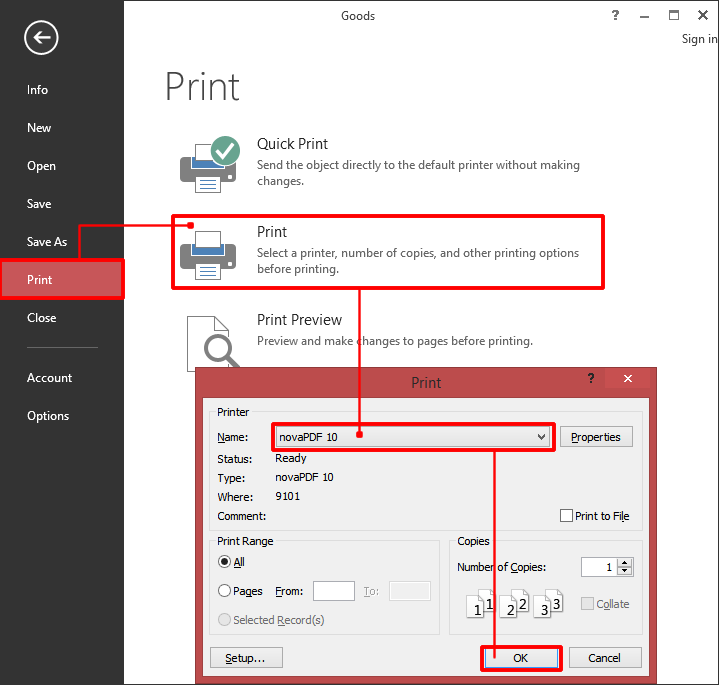 Select the report you want to convert to PDF then click on File->Print (or press Ctrl+P) and click one more time on the large Print section. From the Printer list window that opens select novaPDF. 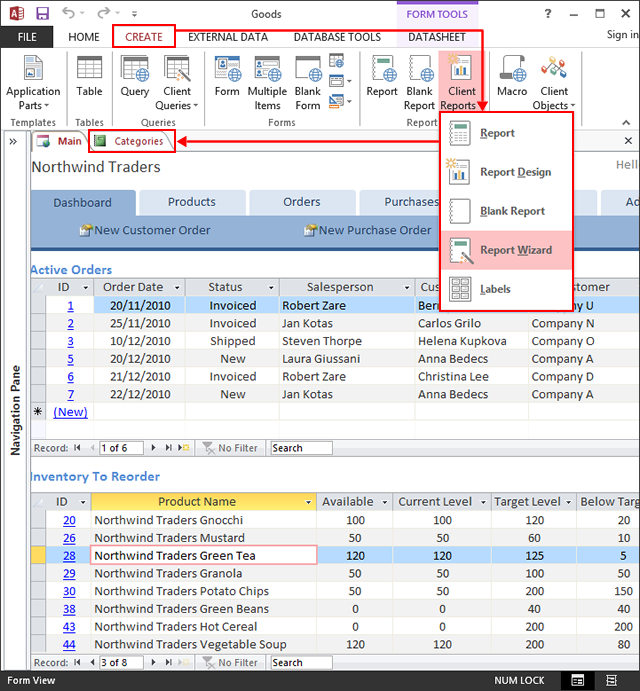 The other Microsoft Access database objects (tables, forms or queries) can also be converted to PDF documents in the same way as the Access reports. 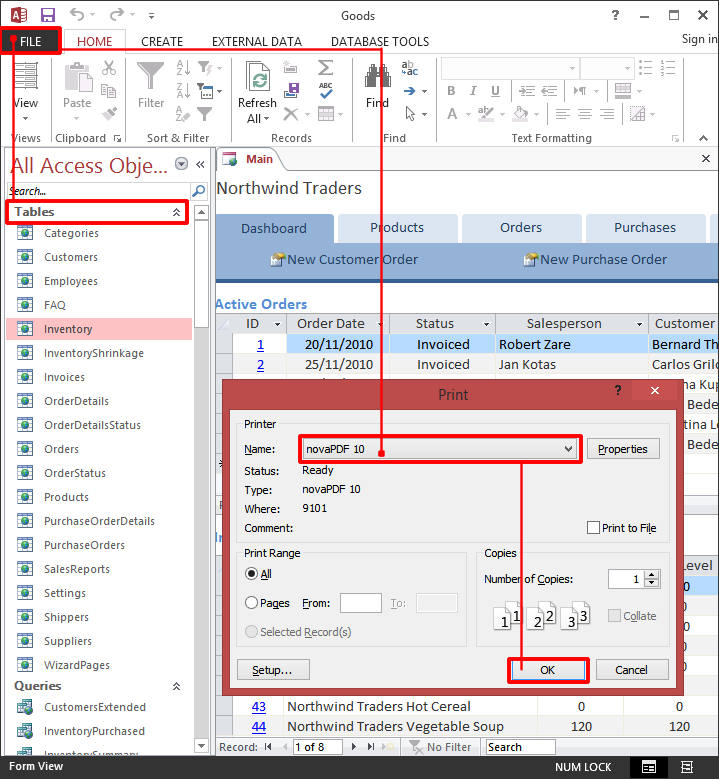 Open the Access database and expand the Navigation Pane on the left side to view All Access Objects. Click on Print again to open the printer selection window and choose novaPDF. If you are a developer and your application communicates with Access (or stores data in its format), you can use one of our PDF tools for developers, novaPDF SDK, to programmatically convert Access reports to PDF files without any user interaction. Integrate novaPDF SDK with your application using the provided documentation. Use the Microsoft Access sample (PDF Reports Access sample) to test its functionality (full source code files are included in the setup package). This tutorial describes how to convert Access objects (reports, tables, forms, queries) to PDF files using novaPDF. If you have any suggestions on how to improve this article add a comment or rate it.